We're also offering FREE SHIPPING on our Preorder section! and you will be refunded after checkout! Nows the time to stock up on those bundles you've been eyeing! 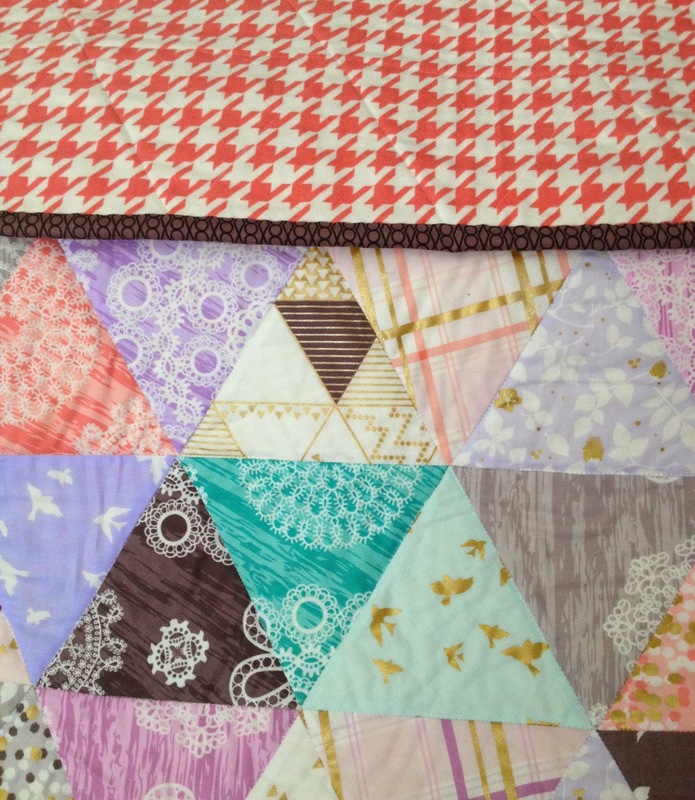 This weekend I decided I needed to scratch an itch i'd had and made a triangle quilt. I knew the new line Brambleberry Ridge by Violet Craft. The colors play together so nicely and the subtly of the metallics gives it a nice finish. I backed it in a flannel pink houndstooth I have to give it that added layer of comfort and coziness! I've had a bundle of Anna Maria Horner voile in my stash for some time. I decided to get chopping and put it to good use. 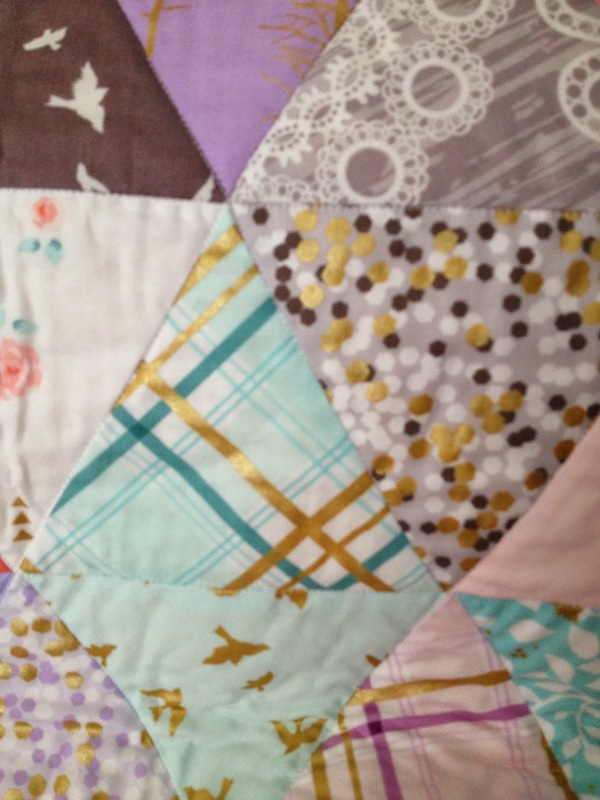 I went with a simple patchwork quilt and backed it with AMH from Hand Drawn Garden. My favorite thing about this quilt is how lightweight it is. The voile gives the top a silky feel and the cotton backing is super lightweight. There is 100% cotton backing inside for durability. I did a simple double line of top stitching and tied it to keep it light and lofty. 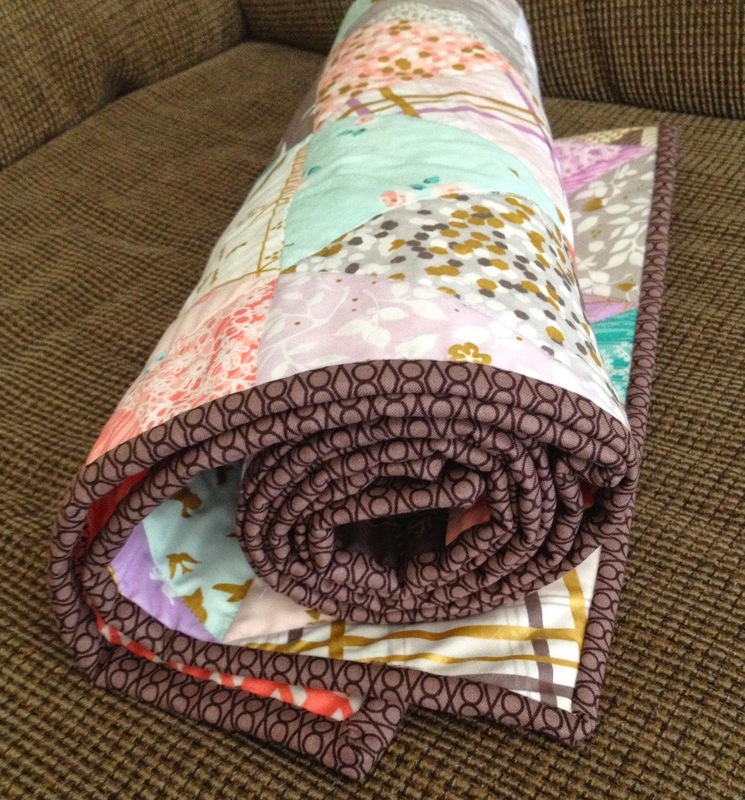 This blanket is the perfect addition to any household for a light summer quilt or great as a picnic blanket. My lovely sister modeling the perfect picnic blanket for your summer barbecue. Size - approx. 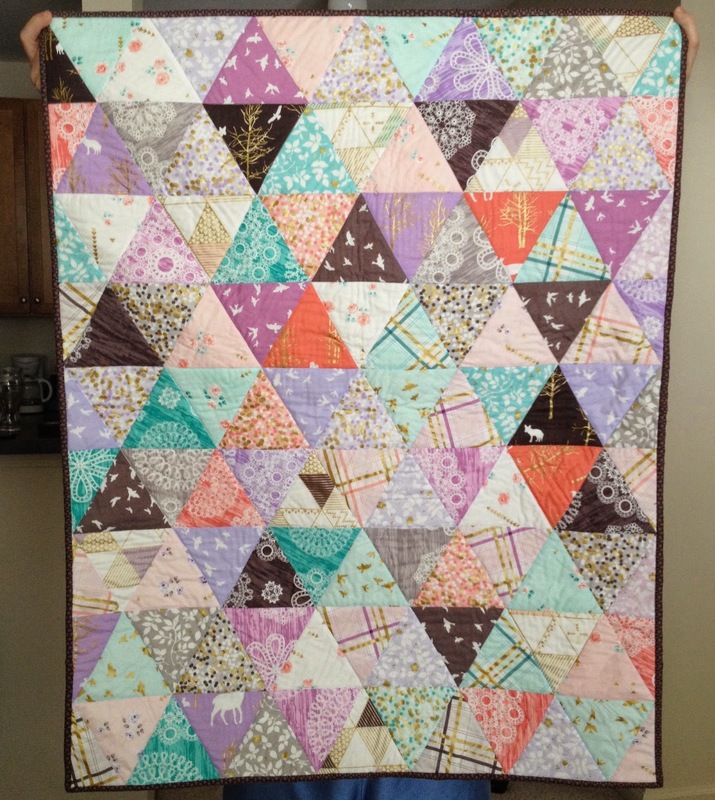 63" x 77"
It's finished and ready to find its way to a new home for some love and cuddling! So back in March I started a project that I could only reveal in small pieces on Instagram (@knotted_thread) if you're interested in following! My best friend of 25 years is getting married this summer and I decided a quilt… a substantial quilt was needed to gift her. She has been an irish step dancer since she was 5y.o. and in college we even traveled to Ireland together for the All Ireland competition. This being said, the quilt pattern "Triple Irish Chain" was a no brainer. Let's just say… she EXCEEDED anything I had mentally thought this would be. Her attention to detail is absolutely amazing and I couldn't have been more thrilled with out it turned out! See! Silly mom and her fingers over the lens… awesome. Congratulations again Maggie and Augie!! Just popping in to let you all know about some new lines we've had arriving in the shop! Pretty Potent by Anna Maria Horner showed up at the end of last week and i've been cutting and bundling feverishly with this one. The prints and colors are a great light to dark contrast. I have no idea where she comes up with her designs... but i'm so glad she does! Nouvelle by Pat Bravo showed up this week, i'm loving these colors and Maureen has a stunning quilt in the works at the moment that has me itching to play with it! Phew, that's all for now, we've got Mochi Dots and Arizona showing up later this month which I'm pretty excited about! Don't forget to follow on Instagram (@knotted_thread) - every Friday is POP UP SALE Friday and I have a limited number of bundles at a special discounted price!! Starting the week off running - I was able to get some of my Tula Sampler blocks done! these are on my FAL list so it's progress. Plus, while looking through my book to see how many I was missing, I realized that I started the sampler exactly one year ago! At the time I figured I'd be done with them by Christmas (wishful thinking!!). Anyway, here's what I was able to complete.. I'm finally starting to play catch-up and first up was some overdue bee blocks. Technically April only ended yesterday, but I was feeling VERY behind so it feels like they're overdue. Annabella was the bee momma in April and though she lives in Morocco she asked for some autumn blocks (I can totally relate after not having fall in Hawaii last year!!) She wanted 2 blocks, one in a traditional "fall" color and the other in a jewel tone. Now I know Annabella is crazy for Tula, so immediately I jumped in making her jewel tone block. It wasn't until last night that I realized she wanted scrappy or 2 toned blocks. Crap. I put the picture on instagram and told her i'd redo if she wanted. Then, 5 minutes later I felt so bad about not following her request I pulled it apart and added another fabric to make it the two tone she wanted.